Grass silage has a large nutrient demand and adequate N, P & K is essential for maximising grass yield and producing sufficient winter feed. 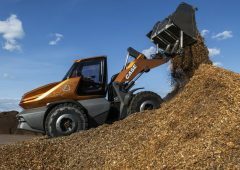 Soil pH – Maintain soil pH at 6.3 to 6.5 for optimum grass production. Essential to maximise the availability of N, P and K in the soil. Nitrogen (N) is the key driver of grass yield. Grass swards with high levels of perennial rye grass will use N more efficiently than older swards. Recently reseeded swards (0-3 years) will have 25% higher N demand, especially when reseeded after a tillage rotation. A crop of grass silage (5t/ha of DM) will require 125 kg N/ha (100 units/acre). Grass silage will take up on average 2.5kg/ha/day of N (2units/day), therefore apply N at least 50 days before cutting to ensure full N utilisation. Phosphorus (P) and Potassium (K) are essential to maximise grass yields therefore adequate supply of these nutrients in the soil is critical. Assess the most recent (3 to 5 years) soil test reports to determine the P and K requirements (in organic manure and fertiliser) for silage fields. A crop of grass silage will remove approximately 4kg P and 25kg K /tonne of grass DM. Organic manures are an effective source of N, P & K and can provide a large proportion of crop P and K requirements at relatively low cost. 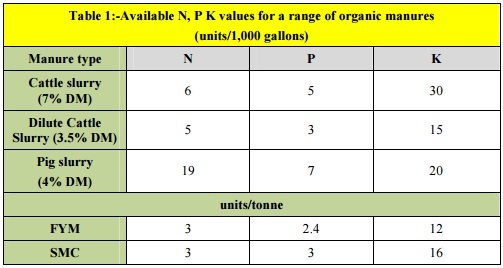 Table 1 shows the Available N, P & K content for a range of organic manures. Cattle slurry is the most common manure applied to silage fields and can vary in nutrient content depending on its dry matter (DM) content. Diluting cattle slurry with water is beneficial for ease of agitation and can help to improve the N availability in the slurry, however it will also dilute the P and K content of the slurry (i.e. a larger quantity of diluted slurry will be needed to supply the same levels of P and K as undiluted slurry). Table 1 shows the N, P & K values for normal and dilute cattle slurries at different DM %. 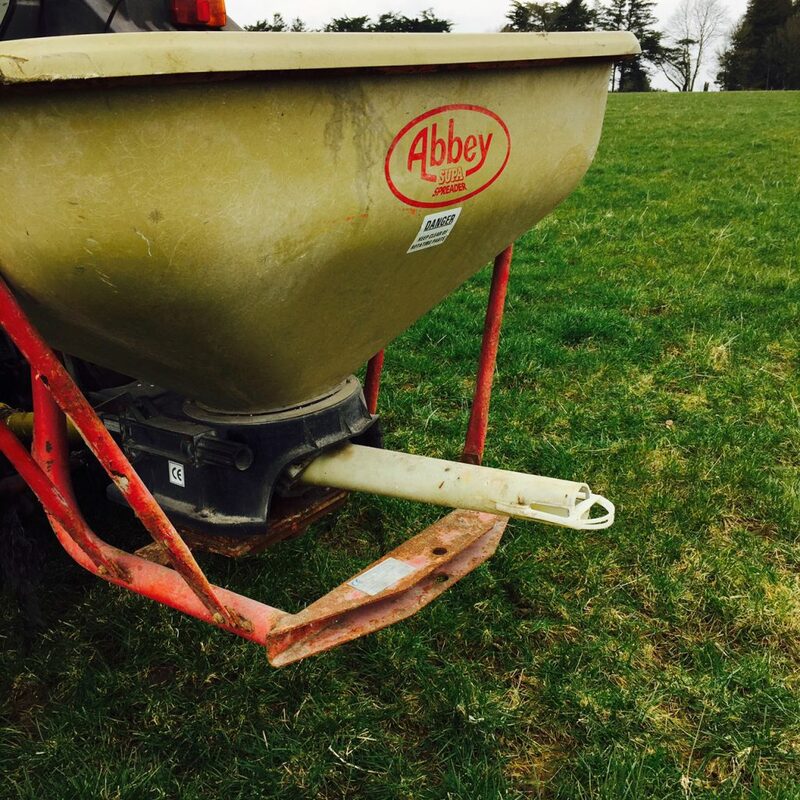 It is important to take account of slurry DM content to reduce the risk of under fertilising silage crops. The slurry hydrometer is a tool than can be used to assess the DM% of slurry helping you to predict the nutrient content more accurately. For example 3,000 gallons/ac of good quality cattle slurry (7% DM) will supply sufficient P and K levels to grow a crop of grass silage. 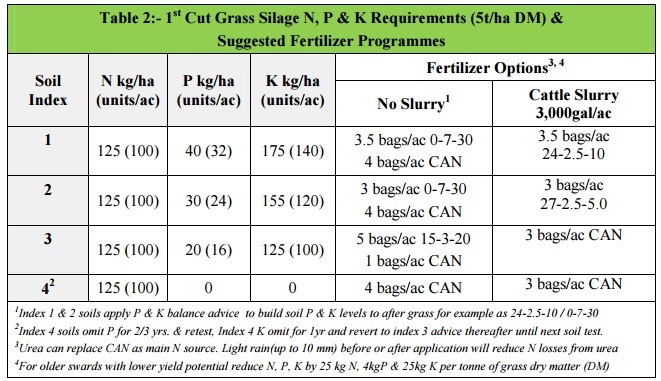 Table 2 shows the recommended rates of N, P & K at different soil P & K indexes (1 to 4) required for 5t/ha grass dry matter (10t fresh grass/acre). Apply crop N, P & K requirements when closing silage fields in late March/early apply April. 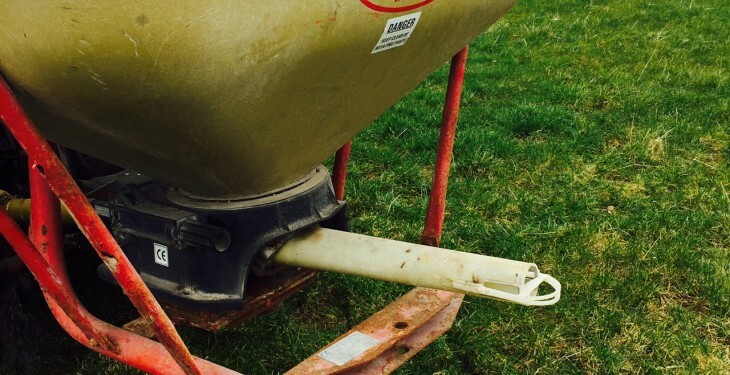 Where cattle slurry is applied, delay the top-up fertiliser applications for 1 week. In wetter soil conditions fertilizer N can be split 50:50 for example 50% in late March/early April and the remainder two weeks later to reduce the risk of N losses. Sulphur deficiency is most lightly on light sandy/free draining soils with low soil organic matter. Grass silage crops have a requirement of 20kg S/ha per cut. The application of S to soils where it is required will improve grass DM yields and quality as it helps to maintain an optimum N:S ratio and N to be used more efficiency. Apply S with main N split as N +S (e.g. CAN +S / Urea +S). A good rule of thumb for S is apply 1kg S for every 10kg N, for example 100kgN/ha required 10kgS/ha. Prepared by Mark Plunkett, Teagasc Johnstown Castle.